This guide was created to combat some of misinformation on the web about cold lasers and PhotoBioModulation (PBM). This is a no-nonsense guide to cold lasers and high dosage lasers ranging from low-cost home system to high-end systems for practitioners. You can use this guide in conjunction with our therapy laser comparison table to see most of the major players in the cold laser market and how they stack up based on specs and prices. 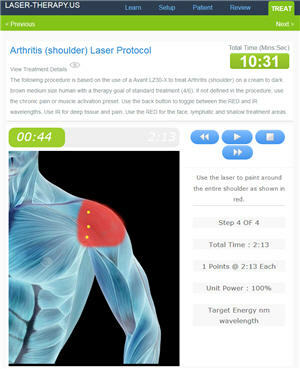 There are over 4000 clinical studies and hundreds of books, video and other resources showing the effectiveness of laser therapy that you can search using the Laser-Therapy.US research tool. There are over 200,000 health care providers using cold lasers in their practice and over 750,000 laser users so laser therapy is not an "experimental" therapy as the insurance companies like to say when they deny a claim for a laser. Even though, most tradition MDs stay away from laser therapy, they are widely used by chiropractors, acupuncturist, physical therapist, herbalist, function medicine specialist, vets, dentist, podiatrist and many other health care providers that focus on root health care corrections versus coping with the symptoms. Although lasers are not a cure all, there should be little doubt that cold lasers are effective in treating a wide variety of problems. The majority of therapeutic lasers are used to treat damaged tissue and structural (bone, joint and ligament) problems but the use of laser to treat trigger points, acupoints and lymph nodes is rapidly growing. Most therapeutic cold lasers have a treatment area between the size of a quarter to the size of a silver dollar, but systems created for trigger point and acupoint therapy focus the energy into a concentrated beam. Cold lasers are cleared for pain reduction, inflammation reduction and increasing blood flow. These variables control the quality of light (measured in Joules for power and Hz for pulsing) administered to the treatment area. In general, a laser's ability to successfully treat a wide variety of conditions is mostly based on output power at an appropriate wavelength with some contribution added from pulsing. In general, the addition of pulsing to laser therapy reduces how quickly you build up the energy dosage but for a fixed treatment time, the addition of pulsing makes up for the lower dosage and then some. The best option is to set the laser on pulsing and increase the treatment time to achieve the same dosage. Most of the scientific research is focused on dosage (which is the total energy put into the treatment area). There is less emphasis in the research on using exotic wavelengths and pulsing frequencies but there is still some evidence that it is important too. Based primarily on Dr. Hamblin's research and publications, we prefer 800nm to 860nm for nervous system and vascular issues. Followed by 600nm to 660nm. 980nm is the preferred option for pain control and 905nm is preferred where safety is the highest priority. At this point, it appears that all the wavelengths are appropriate for treating structural or cellular damage. Much of the misinformation about cold lasers is related to power levels and how they affect the safety and effectiveness of the product. Low power laser manufacturers have lots of ways to justify why their product is the best, but the overall market agrees that power is the single most important factor in determining the efficacy of cold lasers. With the exception of some class 4 lasers (which might have the capability to burn tissue if used incorrectly), more power is better because it allows practitioners to give patients higher dosage when it is appropriate. Many laser manufacturers have a doctor on staff who can write a recommendation letter to make sure that each buyer is getting supervision and training. Class 1 & 2 lasers are can be purchased for use at home over-the-counter for use on humans and they have a maximum power of 5mW continuous per diode. Several manufacturers make higher power lasers that qualify as a class 1 or 2 by pulsing the laser. Without a recommendation for a health care provider like the ones listed above, a pulsing laser is the best option. Just don't waste your time buying anything that looks like a laser pointer. Class 3 lasers are designed for practitioners but can be purchased for use on humans at home with the recommendation of a health care provider. They can be purchased without any restrictions for use on pets and horses. Class 3 lasers must be less than 500mW per laser diode continuous output. Several manufacturers have higher power units that use multiple diodes that have TOTAL power level in the class 4 range, but they are safe enough to qualify as a class 3b device because they have less chance of eye damage and no chance of tissue heating damage. Many laser manufacturers have a doctor on staff who can write a recommendation letter to meet the requirements, so we can sell you a laser. Class 4 lasers are any laser that has one or more laser beams with an output of 500mW or more. Class 4 lasers between 1 / 2 watt and 60 watts can do damage to the eye or to tissue if improperly used. This danger is easily eliminated with training. Class 4 lasers can be sold for home use with a recommendation letter or for use on animals without any restrictions. Many laser manufacturers have a doctor on staff who can write a recommendation letter to meet the requirements, so you can buy any laser that fits your needs. The next factor regarding cold laser effectiveness is the wavelength of the light. Because there is a therapeutic window where energy is best transferred into tissue, most laser operate in the 635nm (Red), the 810 nm (IR), and the 900 to 1080nm (IR) range. All 3 wavelengths have advantages and disadvantages. 600nm to 660nm wavelength is best for shallower treatments, treating lymphatic issue, acupoint therapy and for treating shallow areas. It is also commonly used for more complex problems because much of the energy is absorbed by the blood which flow throughout the body activates different problem areas. Because of the unique properties of this wavelength, it is commonly used in cosmetic lasers. 800nm to 860nm is the sweet spot for combining maximum penetration depth and maximum photo-chemical reaction. Some laser gurus like Dr. Weber and Dr. Hamblin promote 810 nm as the optimum wavelength because it produces the maximum interaction with the mitochondria. 900nm to 1080 nm is very popular with 910nm being the standard for all superpulsing lasers and 980nm being the standard for many class 4 systems. At 980nm, much of the energy is converted to heat and absorbed by the water in the tissue so it is less efficient than 810nm at creating photobiomodulation but many class 4 lasers just make up for the inefficiency with more power. The next factor to consider is pulsing frequency and/or continuous wave operation. A laser can be turned on and off quickly to pulse the laser or it can sweep (operate at a constantly changing pulse frequency). Companies like Erchonia use extremely low power lasers (less than 20mW) and claim that all the" heavy lifting" is done with the pulsing and not the dosage. There is also a theory that the cells can become acclimated to any type of continuous input including continuous wave lasers and the pulsing helps keep the body from becoming desensitized to the laser therapy. Continuous Wave (CW) light is best for getting higher dosages quickly so companies like Apollo make only CW laser. They say that no one knows what the best pulsing frequency is so why waste your time guessing and increasing the treatment times. More expensive lasers do both because sometimes you want the maximum dosage to give people an immediate improvement in their symptoms and sometimes you are OK with a lower dosage if you can get a stronger stimulation effect in the cells. Some conditions can take months of treatments, so some people might give up if they don't see an immediate improvement and stop the therapy. To prevent quitting, many practitioners start out the therapy routine with a higher dosage and then bring it down over time. Lasers with both continuous wave and pulsed wave allow practitioners and home users to optimize each treatment protocol based on the condition and the patient's expectations. A recent summary study of laser therapy research by Huang et all came to the conclusion that pulsing is best for most applications except nervous system therapy. There are a handful of other things to consider. This includes the quality of training (we offer the best in the industry), support literature and the depth of their protocol library. Practitioners often put a high value on flexibility and power while home owner want an easy to use product and safe. If you looking at a system that cost less $2000, you might want to read our article about laser scams and questionable products. Class 4: If you are a practitioner who is concerned about treatment times and you have a structured environment, start looking at the class 4 lasers like the K-laser or EVOlaser. These elite lasers offer the option for high dosages and/or quick treatment times. The best budget class 4 system is the Pilot Laser. If you are a practitioner who wants a simple, yet powerful laser, with no risk of tissue heating, look the Apollo desktop and portable. None of these system are good for laser acupuncture except the Apollo which offers an optional 500mW pinpoint probe and point finder. If you are looking for a class 4 unattended system, the Lumix is your only choice. Class 3: The best overall value in class 3 lasers are the Avant LZ30p, LZ30x and LZ30z portables. They blow away the competition (like ML830 and Erchonia) based on the specs and they do everything well. The Avant Lasers offer both RED and IR wavelengths, both Pulsing and CW output, both broad and pinpoint treatments in one compact package. Another great handheld option is the PowerMedic Pro laser, their acupuncture probe is one of the best option because it is optimized for that application. For a desktop class 3 system, consider the Chattanooga Vectra Genisys (professionals only). For unattended treatments, consider the Avant with a stand or the Powermedic. Class 1, 2 & 1m: If safety is a high priority, the TerraQuant series laser are simply the best. There are probably more TerraQuant lasers in the world than all the other brands put together. Because they use superpulsing technology, they have higher peak power level than you can normally get in a sub 3b class laser. Just stay away from anything that looks a laser pointer as these systems are legally limited to 5mW. Class 1m lasers are limited to 500mW (the same as a class 3b) but cannot cause eye damage unless the laser is focused through a lens. Therefore, a class 1m can be 100 times stronger than a class 2. We know it can be confusing. If you need help, please call us at 1-800-388-0850. We will be happy to answer any question about therapy lasers and we can make specific recommendations based on your needs.